The bier pours a clear very dark deep ruby color with an off white head. This bier is also highly carbonated with tons of tiny bubbles rising up from the bottom of the glass. There is an interesting effect with the head. The head started out fairly rich and almost creamy looking. The head gradually changed to a very soapy head and then collapsed to just about nothing. I suspect that this was caused by the tremendous amount of carbonation rising up from the bier. I seemed that all of this extra gas created the larger bubbles and then collapsed the head. Just an interesting observation I thought was worth noting. The nose has sweet caramel malts, some spicy notes, maybe some of those dark fruit esters, all with that wonderful Belgian yeasty/bready/earthy background. Wow, this is so carbonated I really didn’t taste much. The taste started out with sweet caramel malts but from mid sip on the high effervescence took over and literally washed away any flavors. You regain some use of the taste buds on the finish when the only thing to sense is lingering yeasty notes. This is so carbonated I am actually getting a bloated feeling. It is also extremely yeasty. Now I drink a fair amount of Belgians and I love their yeasty characteristic but this is very unusual. I don’t remember this bier having this taste and high carbonation last year. I’m starting to think that this particular bottle may be over carbonated. The bier is still highly carbonated. As it warms the yeasty character now has almost a bitter quality to it. This is strange even for a Belgian; I can’t help but think something went wrong with this bottle. The high carbonation and the yeast are masking any other flavors this bier may have. I’m going to stop this review here. This is just not getting any better and I know this cannot be a fair representation of this ale; there is definitely something wrong with this bottle. I don’t know enough to know what it is but I suspect that it was released too early and was not properly conditioned. This was the second Belgian dud I had this season. 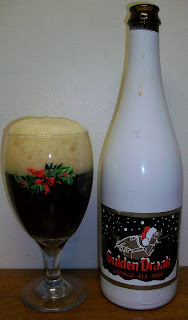 Just the other night I opened another bottle of Delirium Noel and it was flat. I’ll update this post if I purchase another bottle or get a better explanation for this. I'm hoping you just had a bad bottle. Hi William, Thanks for the comment. I also hope you have a better experience. This was a year ago so hopefully it was just still young and need to age. Please let me know how it was.